I like apples because they make you healthy and they help your muscles grow. I love you and I miss you. Please come back. You have did a lot for us. Oh ya, you are in the two bite club. I just wanted to say that I love you. I wish you were here everyday. I love you in my heart beat forever. It was fun when we went to the Farmer's Market. We tasted some fruit. I tasted some strawberries, blueberries, and cherries. I loved the strawberries and the blueberries and cherries because they were good and sweet. Today we went to the Farmer's Market, and we tasted different fruit. They were good. I ate a cherry, a blueberry, a strawberry, and mexican mango. I saw some new fruit. I saw and tasted a fig. I also tried temptation fruit again. We did go see the new fruit. We tasted fruit no vegetables. We saw a jackfut it came from Africa. The field trip was fun. We went Farmer's Market. We got to taste different fruits and we didn't know how it tasted. And I thought the figs was going to be nasty but it was good. I saw fruits and vegetables that I didn't know what it was. That thing that looked like a big 'ole C. It was white. It feels soft. This part feels like an egg. It was an eggplant. There were some black things that Miss Janet bought. It was an eggplant, too. July30,2007 we first talked with Mr.Alex and we asked some questions . Then he gave us some samples of cantaloup and mangos the mangos was nasty . Also we saw some baby cucumbo. Then we talked to Ms.Sandrze and asked her some questions.Anthother thing we passed a plant growing with peppers.Then we talked to Lecia Thompson and her some questions. She showed us cretta peas.Then we saw some figs that come off a big tree they are so small and green.Then we tasted a peach that grow in Aurcinsa.It was good! Then we pass by some honey.Then we talked to Mr.Michel and asked him some questions. Yeah cherries grow Washiton. Then we talked to Mr.German and him some questions.Then passed a Jack frut is a Tropical fruit tasted liked a mango also it grow in Africa and the Rambutan. So July30,2007 I learned many diffrent fruits and vegetables and where they come from. I took a picture of fruits I didn't like, except I still tasted it. Like raspberries. And I was good and Ladarrius and Jordan was bad, picking up everything. And I helped Ms. Keilani with her bags and she gave me a mango. I like all of them (fruits we tasted). Daedrin: What was your favorite vegetable or fruit? Jasmine: My favorite fruit was the pineapple. Daedrin: Did you like it? Jasmine: Yes, that is why it was my favorite. Daedrin: Did you have fun? Jasmine: I did, but I would have had more fun, if EVERYONE behaved. Jasmine: Not you, you were good, today. Daedrin: Why did you tell us to not pick up fruit? Jasmine: I didn't want you to get in trouble with the fruit sellers. Daedrin: Do you know all the people who've been bad? Jasmine: You mean, on the field trip? Daedrin: Uh huh. And who did you have to talk to? Jasmine: I had to talk to the other two people in our group. Daedrin: Okay. Have you went there before? Jasmine: I went there when I was your age. But not since then. Daedrin: How did you feel? Jasmine: How did I feel about the farmer's market or about the behavior problems? Jasmine: I felt great about the market. There were a lot of people there. And they all seemed really nice. I wish everyone behaved better. I would have had a better time. RAP, TODAY I LEARNED A NEW WORD METABOLISM IT GIVE YOU ENERGY JUST LIKE WHEN YOU EAT THE SUGAR CELLS THOUGH YOUR BODY LIKE A STREAM WOOSH! ALSO WE EAT WATERMELON MMM!SOUNDS GOOD .YEAH,WE TALKED ABOUT A FITNESS CENTER THAT ITFOR HEALTY IT IS FOR YOU SO IT CAN STICK TO LIKE GLUE NOW DO BELIVE ME.ONE MORE THING WE EXERSIZE. I learned about exercising, muscles, eating healty food. Muscle can burn sugar in your body. I liked when Mr.Darren gave us a goody bag. Typed by Jasmine, dictated by Buddy. I learned about new stuff. The stuff that I like. I learned more about different kinds of muscles. I learned that from them books. I learned that blood is blue when it is inside your body. I learned about nutrition and stuff like that. We learned from Mr. Darren that we had muscles right here and right here (points to calf and thigh). When we did our blog. Today we did exercise, we did push ups with weights, we had snack, we got write. I learned about calories. I learned that fruits and vegetables can grow. My favorite part was when we lifted up the lake. It was fun because we picked up half a lake. RAP,TODAY I LEARNED A NEW WORD METABOLISM IT GIVE YOU ENERGY JUST LIKE WHEN YOU EAT THE SUGAR CELLS THOUGH YOUR BODY LIKE A STREAM WOOSH! ALSO WE EAT WATERMELON MMM!SOUNDS GOOD .YEAH,WE TALKED ABOUT A FITNESS CENTER THAT ITFOR HEALTY IT IS FOR YOU SO IT CAN STICK TO LIKE GLUE NOW DO BELIVE ME.ONE MORE THING WE EXERSIZE. Metabolism is used for sugar to give give you energy. Mr. Darrin gave us get it bag for answering questions, and I was sick and my granny said she was picking me up but she didn't, and I through up. I am still sick. I really enjoyed watching Ladarrius be the photographer today. He seemed to really take his role to heart. I watched him crawl under the table and lay down on the floor to get an interesting angle on a photo. Then I watched him get up, walk across the room, and climb over a chair in order to get closer to the subject. I hope you enjoyed your job, Ladarrius. You did a really good job! The field trip was fun. It was fun when we were walking around looking at the new exercising that we didn't know about. I learned about new exercises. I learned about calves and hamstrings and gluts. My favorite thing was when we had went to the college. I love the ASA. I like it when Ms. Janet take us on field trips. Yesterday we went to UTA gym and meet Mr. Darrell and he showed us the workout equpiment. July23,2007 we went to the U.T.A College in at the big we went to the fitness center and we met a man named Mr.Darrell he took us in this huge exersize place so we went to one of the machie and talked about this screen that could show telvison while you exersize so we went on and talked about many diffrent muscles and sports . Then we went to the smaller one and it was kind of the same but smaller also we discovered a ball that you can do many exersizes only on one ball.So I learned many diffrent muscles. You can click on the pictures to get a more up-close view of them. Though not the Historian for the day, Daedrin did some great reflection on the way back from our trip to UTA's fitness center. 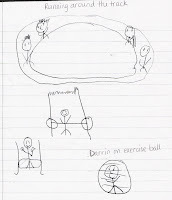 Above are some of the pictures he drew, showing us what he saw in the fitness center. Below is a picture of Mr. Darrin high-fiving one of his friends at the fitness center. Check out Mr. Darrin's friend's earrings and Mr. Darrin's baseball hat. Great attention to detail, Daedrin! 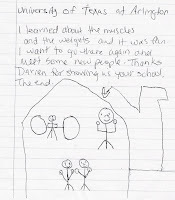 You're making some great observations, Daedrin! I'm anxious to see what you drew at home last night! Keep up the good work! I LEARN THAT FRIUT REALLY HELPS YOUR MUSSEL GETS BIGGER AND IT ALSO HELP YOUR ENGERY, AND IT YOU STORNG. i TOOK ALOT OF PICTURES OF FRUIT. Today I went to Day camp, and I had so much FUN. The class took a field trip to the store and divided into food groups I was in the grain group I had alot of fun! Hello again, this is my other niece Brianna. we had-wnet_to_the_store today. We had went shopping. Ms. Janet had showed us a video about Kashia. We had did exercises. We had did push ups and we had did jumping jacks. Today we went to the grocey store and shopped as we shopped we read some nutrion facts and also mutipled to see how we could get 14 then checked out the grocies so today I learned to check the nutrion facts. Also when we did some exersize to build our mucsles then we took a water break.So when you go the store read the nutrion facts so you can learn. I went to the grocrery store today, we got vegetebles, the veggies we got were broccoli, spinach, corn-on-the-cob. My favorite part was picking out the broccoli with Ms. Sylvia. Today we went to the store and we got milk, cheese, food for dinner today. We did excrise. For snack we had graham crackers and cheese and I like it. The After-School program is fun. It's a bunch of things to do. We went to go get salisbury steak at the store today. Hello my name is Danille and I am visiting the camp were my aunt Wyshina works and my favorite part of the day was the trip to the grocery store and the exercising. I had fun at the store, my leader was Ms. Jasmine, and I got to pick out the fruit. I liked when we got on the computers. Thank you to all the teachers and my aunt Wyshina. Everybody was nice thank you. We went to the grocery store. We had fun. We was looking at the healthy food with Ms. Keilani. I learned about the meat. It was healthy. My favorite thing today was going to the store. Those apples look good and tasty! I love juice becuase its good for you and makes you healthy! I like strawberries they are so sweet, and just want to eat the whole basket. I like the Central Market it was fun and I would like to go everyday. I like it when Ms. Lily let us taste the different fruits. They were all good. At Central Market we tried all kinds of fruit. Daedrin did a great job of tasting, but he really doesn't like tomatoes. Passion fruit. Sour. It tastes good. Tastes like a lemon. LeDarrius took the picture. Yes, it was my favorite fruit. I tried baby pineapple. I tried watermelon. I tried champagne grapes. I tried blueberries. I tried passion fruit. I tried jazz apples. I tried them what you call them nuts. Them thang nuts. What were those nut things called from China? Yea, those lychee nuts. I tried champagne grapes. They were good. I tried you know them watermelons, those white melons that got something on the inside? What's it called? You know them imitation melons? (You mean temptation melons). Yea, that's all. This is the being of the trip when was starting see those fruits we tasted .Try to eat some. I did it. I tried to bite the tomatoes and it wasn't good. I should've tried the little tomatoes. The baby pineapple was juicy and good. It was yummy. It was my favorite. I didn't have it before. When I went to the store I saw big ones. The champagne grapes were good. You put them in your mouth and pull them out. They was good and yummy and stuff. They was delicious! I DOWNT LIKE GREEN TOMATOS COSET THEY ARE NATSTEY I LIKE RED TOMATOS COSE THAY ARE JUICY.